These activity pages are similar to our coloring pages except they have fun and educational fill in the blank activities on them. This collection corresponds to Year B (Year 2) First Quarter Bible lessons of a three year cycle. This special Teacher's Edition allows you to make copies for certain types of uses. These 13 beautiful Activity pages correspond to the Year B (Year 2) 1st Quarter lessons. These activity pages are in the .pdf format, the same as is in our free collection of coloring pages, however these are much higher quality. 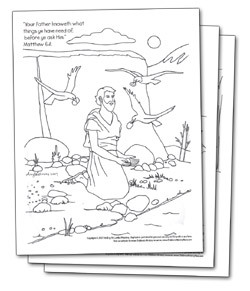 These activity pages can be used at home or photo copied for your use in your children's church school classes.